Dream. Dress. Play. 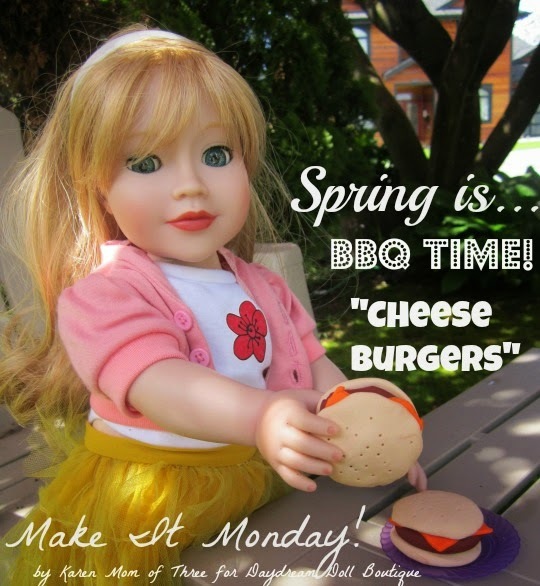 : Make It Monday Dolly Cheese Burgers! Spring is the start of BBQ season and on nice days like today you can smell the BBQ's going as soon as school is out! 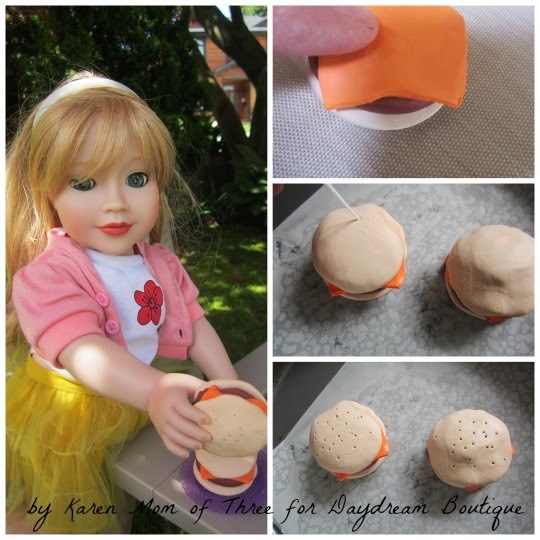 Today I want to show you how you can make your own doll sized Cheese Burgers from oven bake clay for your dolls to enjoy this BBQ season. Step 1: pre heat your oven to the directions on your oven bake clay package, cover your work space with wax paper. 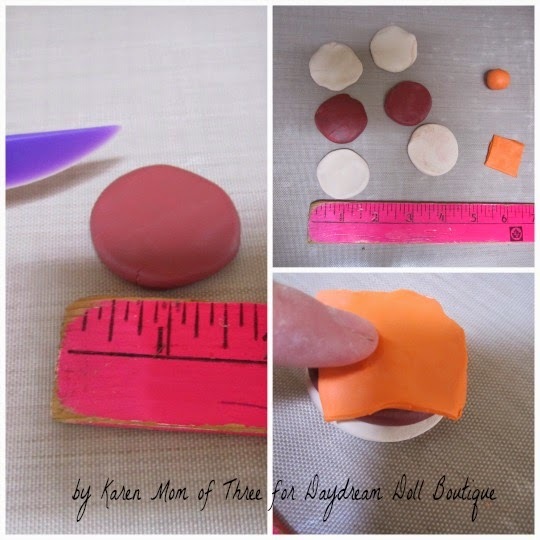 Step 2: Unwrap your dark brown clay and work it with your fingers into two one an 1/2 inch "flattened patties" set aside and wash your hands so that the darker color on your hands doesn't transfer to your lighter tan clay. Step 4: Time to add the cheese, unwrap and remove a small amount of orange from your clay package, roll it out and flatten it, then use a craft knife to create a square slice of cheese. Step 5: Assemble your cheese burger and gently top with your top bun.Then use your tooth pick to make the "seeds" on your bun. 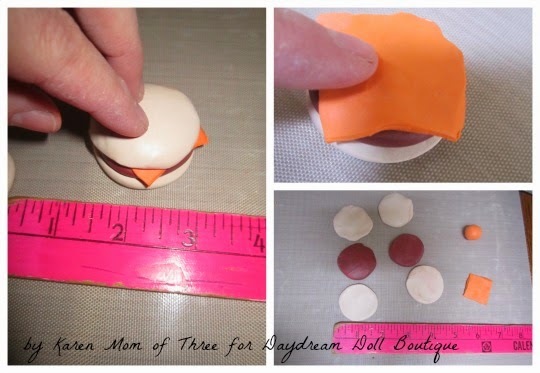 Gently poke holes in the top of the bun. Step 6: Place it on a baking sheet and bake according to the clay package directions. 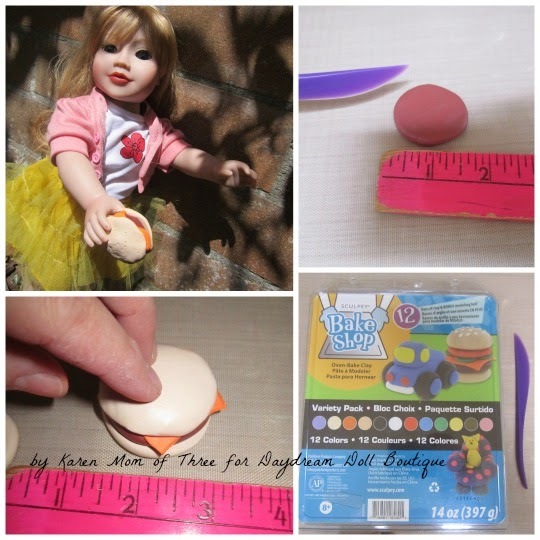 Remove and cool before allowing your dolls to eat them! I look forward to sharing more Make it Monday crafts with you again soon! Wonderful tutorial! What kind of doll is that in the photo? She is gorgeous.